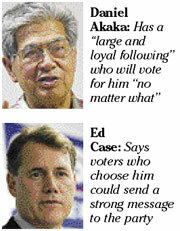 THE RACE between longtime U.S. Sen. Daniel Akaka and Democratic challenger Rep. Ed Case may hinge on who can turn out more votes -- labor unions and other traditional Democratic Party loyalists or independent voters, perhaps even crossover Republicans. Don Clegg, a political pollster and campaign consultant who is not working for either candidate, said Akaka has a "large and loyal following" who will vote for him "no matter what." "But is there enough of those people?" Clegg said. "I'm sure Ed has looked at it and felt there isn't enough. He's going to get the votes from the newer Democrats, the ones who are not so tied to voting Democrat no matter what." Former Democratic Party of Hawaii Chairman Walter Heen said Case will have a hard time, though, attracting native Hawaiians and union members, the bulk of whom have associated with the Democratic Party. The native Hawaiian bloc, Clegg said, could prove a significant factor in an Akaka win. "He'll get the native Hawaiian vote," Heen said. "Dan is their icon." He also said it was a long shot to count too much on independents and Republicans. "Crossover votes never work," he said. "I don't see that really as being the ability to mount a challenge." However, Clegg said the victor could very well be the candidate able to bring out a growing bloc of moderate, independent Hawaii voters who don't call themselves Democrats or Republicans. Republican Gov. Linda Lingle, Clegg added, "didn't win by getting a bunch of Republican votes." Clegg said the campaign will be a big test for the solidarity of the Democratic Party's membership. Loyal Democrats have come through for Akaka before, Clegg noted. In 1990, Akaka went up against his most recent formidable opponent -- Republican Pat Saiki. "Saiki was ahead until it got down to the last lap, then Dan pulled away," he said. Both Case and Akaka say they're confident they can attract voters across the political spectrum. In a telephone interview yesterday, Case said he had reviewed at least two surveys in mid-2005 to help gauge his chances of winning. The surveys were conducted by organizations not affiliated with his campaign. * Favorable opinions among voters were about the same for both candidates, he said, adding Akaka had slightly higher unfavorable ratings. He could not provide copies of the surveys yesterday and did not remember the exact questions asked. "I was comfortable that I had a very good shot at prevailing," Case said. "I wouldn't have done if it I didn't believe that we could win." Case, who identifies himself as a moderate Democrat, also said he would work to attract the "solid Democratic core, plus independents and Republicans." "There is no such thing as a monolithic Democratic voter. Democrats and independents leaning Democrat come in many shapes and sizes. Clearly, I'm going to get many, many Democratic votes. There's no question that my challenge is to explain to the voters why I believe it is so crucial to make these changes now, regardless of how they do or don't feel about my opponent." The 81-year-old Akaka said his biggest asset against Case, 53, is his seniority in the Senate. He disagreed that Hawaii would be left hanging if both he and Sen. Dan Inouye, also an octogenarian, were to retire about the same time. He also said he's confident that he'll be able to attract voters aligned with the party, along with those on the sidelines. "I am looking to try to reach all of the different kinds of people," he said. Since Case announced Thursday that he was running for the Senate, Akaka has been barraged by calls of support and has gotten the backing of Inouye and other leading Democratic senators. Case has heard from supporters, too. But, he said, he's also received e-mails and phone calls from voters with "questions" on why he would challenge a Hawaii icon. Case said he doesn't "talk and walk lock-step with my own party." He also said voters who choose him could very well be sending a strong message to the party. However, when Case ran for governor in 2002 against Mazie Hirono without the support of unions and other party loyalists, he lost the election. » U.S. Rep. Ed Case said surveys were done by organizations not affiliated with his campaign before he decided to run for the U.S. Senate. A story on Page A1 Sunday said incorrectly that Case had conducted the surveys.